Jimmy accepted Christ through The Greatest Journey. He's excited to disciple younger children now. 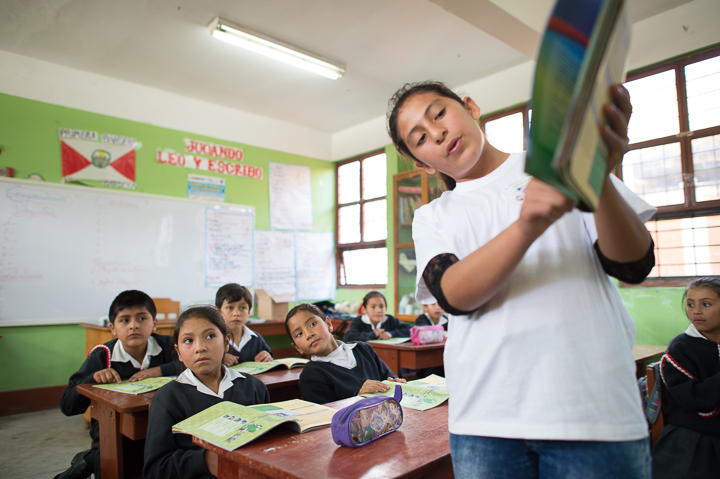 Christ's Kingdom expands in Peru as children and their families are reached through Operation Christmas Child and The Greatest Journey. The village of Chota, home to 30,000 people, sits nestled in the Cajamarca district of the highlands of Peru. Surrounded by green peaks reaching 11,000 feet above sea level, Chota lies 3,000 or so feet below, and the residents struggle with rampant drug abuse, alcoholism, and poverty. 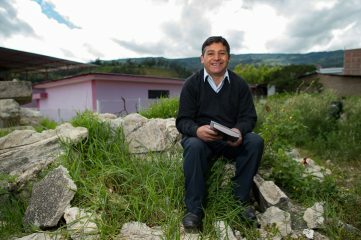 Three years ago a group of nine believers led by Pastor Teodoro Quispe began gathering to study God’s Word here in this difficult place. About two years into their gatherings, Pastor Teodoro gained permission from city officials to host a large evangelistic outreach for children on February 28, 2015. A group of 250 children gathered to hear the Gospel and receive Operation Christmas Child shoebox gifts. Together with their parents and other visitors, a total of 600 people attended. Sixty children accepted Christ that day along with some of their mothers and fathers. “Right after this, children started to come Sunday after Sunday for The Greatest Journey,” Pastor Teodoro said. Pastor Teodoro’s church started through The Greatest Journey. This Samaritan’s Purse discipleship program for boys and girls who receive shoebox gifts teaches them how to have a relationship with Christ, grow deeper in their walk with God, and share their faith with family and friends. “This is actually how our church started,” Pastor Teodoro said. The classes became a springboard for the formation of a brand-new congregation. Now this body, named House of Worship, consists of 40 children and 20 adults who gather weekly at a rented storefront. Even though 13-year-old Yesenia’s shoebox was filled with crayons and a glittery ball, the item she most treasured was The Greatest Gift, a Gospel story booklet that Samaritan’s Purse distributes with many shoebox gifts. She especially appreciated the Bible stories because she received Christ into her heart that day and soon began attending The Greatest Journey. Yesenia’s entire family became believers through The Greatest Journey. Now she shares that gift with other children. Wanting to share her newfound faith, Yesenia invited her mother to church. Although not initially interested, she soon began attending and surrendered her life to the Lord. In time, Yesenia’s father and two brothers also became believers in part because she came home from The Greatest Journey classes and told them the stories she’d heard. Lenddy, 14, received a shoebox gift and then participated in The Greatest Journey program. Pastor Teodoro soon told her about the needs of other children in their community. Inspired to do something about those needs, she trained to become a teacher of The Greatest Journey. Although 13-year-old Anita had received Christ before she received her shoebox gift, The Greatest Journey lessons influenced her significantly. Anita’s favorite lesson in The Greatest Journey was about David. “Since he had faith in God, he was able to defeat the giant,” she said. She wants to apply that kind of belief to teaching The Greatest Journey. “I want to share the stories about God so more people can have faith in God,” Anita said. Alicia, 21, taught The Greatest Journey to these four young people. She said it was a joy to see her students grow in faith. “I pray that they stay at the feet of Jesus and they keep going on as teachers,” she said. “People in the community are really impressed with the changes they’ve seen in the young people here,” Pastor Teodoro said. Through their growth, his church has changed. “I am very grateful to God that He used Operation Christmas Child to help us. They have a very particular strategy to evangelize, to disciple, and to get children involved in a praying network,” Pastor Teodoro said. His last comment references the fact that children who attend The Greatest Journey are encouraged to intercede for family and friends who don’t know Christ yet.